At HP, we know that in retail and hospitality environments, customers expect a fast and simple way to find information or to complete a transaction. The physical point-of-sale experience must rise to meet the demands of retailers through high aesthetic value and peak performance. From an elegant hotel to a small boutique, a quick-service restaurant to an outdoor garden center—all of these locations require a point-of-sale device that meets specific needs while appealing to any user. 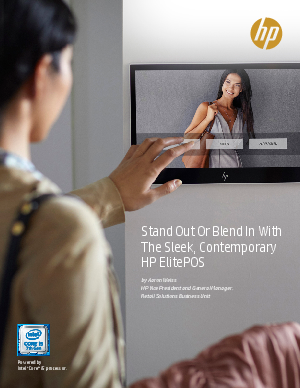 My team at HP sought to elevate this experience by redefining the customer experience through a versatile, reliable, and beautiful point-of-sale system. For the new HP ElitePOS, we gained insights from everywhere—designers, technologists, retailers, and consumers—to create a product that is beautifully simple. It started as a sketch on a napkin, and is now part of an iconic portfolio that dissolves barriers during point-of-sale customer interactions.